You can enter and review the narrative part of a report for each reporting period (Interim and Periodic reports) at Implementation > Reporting > Progress. For FP7 projects, you can enter the descriptions for Publishable Summary, Project Objectives for the Period and Project Management during the Period, Overview of the Progress and a work progress description for each activity running in the period – work packages and tasks (and sub-project if defined). For H2020 projects, you can enter the descriptions for the narrative sections of the Technical Report – Part A and Part B, and also a work progress description for each activity running in the period – work packages and tasks (and sub-project if defined). With the the drop down you can filter the displayed reporting parts. For H2020 only: First make sure you have filtered to see the desired reporting parts from the drop down first e.g. Technical Report – Part B. With the the drop down you can filter the displayed reporting parts. To enter the description, click on the Edit button (while editing a section no other users can edit the section). Enter the description and click Save or Close. Optional: You can finalise the section by clicking the button. This locks the section and disables further editing. NOTE: Unlocking a section is available to users with Coordinator Rights only by clicking the button. 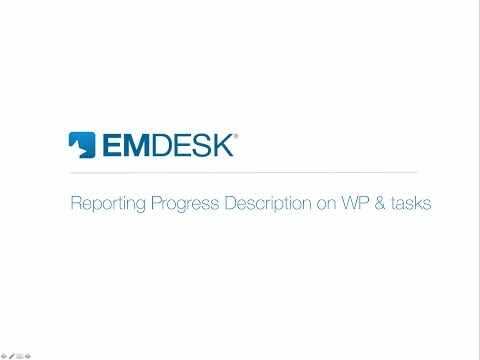 EMDESK auto-opens the next report due by default. To access other reports of the sections, please click in the upper right in the section details. Only relevant reports for the section are accessible and listed chronologically. Relevant reports are crossing the activity actual timing. To open a report from another period click on . This opens the report in view mode. The due dates of reports are according to the schedule previously made here. In order to help you prepare a consolidated progress summary description for a Periodic Report from the interim reports, we provide an overview of all progress reports for each activity – work package or task – when you click the View all reports button of a reporting item. An overview of the progress reports for the interim reports will become visible and you’ll be able to enter a summary into periodic report. As progress descriptions are descriptive in nature, they are not auto-consolidated from each individual interim report to the periodic report. Every activity (Sub-projects, WPs, tasks) and reports can be viewed by all users. Only users with Coordinator Rights have the access rights to edit any item. Users with Contractor Rights can only report on activities their contractor is leading or is involved in according to the planned person-months defined by the active DoW. The alert icon indicates that your contractor is the leading this WP or task and required to report on its progress and enter a description for the upcoming interim or periodic report. Note: You must define the actual start and end month at the task level, and indicate the tasks’ completion in percentage (%). At the task level only you define the actual task completion in a percentage. Use the drop-down menu Completion within the specific task at Implementation > Reporting > Progress. Please note that the completion of a Subproject or Work Package is auto-computed based on the reported completion of all sub-level tasks and by the amount of planned efforts at each task. For example, a task that consumes 90% of all task’s efforts in a WP impacts the WP completion by 0.9. To adjust the actual start or end of a task, use the drop-down menu Actual-Start or Actual-End to set the new actual start/end month of the task. Please note that the actual start and end of the parent Subproject and Work Package is auto-set to the actual start month of the earliest beginning sub-level task and the actual end month of the latest ending sub-level task.